Looking for a Fun Family-style Summer Dessert? I got you covered with these make your own Ice Cream Sundae. 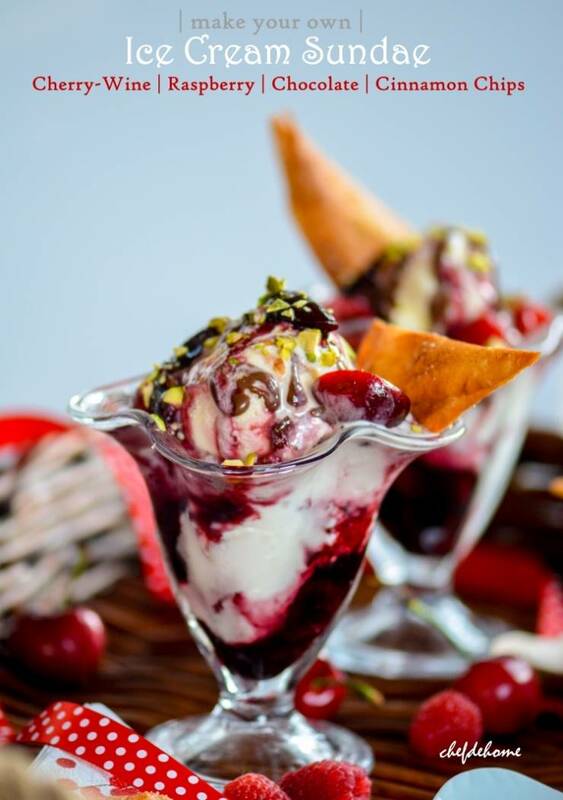 Fruity, tart, and floral Red-Wine Reduction Sauce, and sweet and chocolaty Raspberry Sauce, and crunchy Cinnamon-Sugar Chips for scooping, these fun-topping Ice Cream Sundaes offer something for everyone in the family! My Memorial Day weekend was crazy lazy and full of watching TV, and cooking good food! Too lazy to a point that by Monday evening, I just wanted it to end soon.... I know, I'm classic! Who would ask for holidays to end, but me!? THE BEST thing about my lazy-crazy weekend was "cooking" and watching TV. Due to Memorial Day, few of our favorite movies were aired whole weekend and that kept us very busy. Most weekend, to enjoy movie-time, I finished cooking very early, prepared some snacks for munching while watching movies, and also made some delicious toppings to serve with my favorite, Ice Cream Sundae, in dessert. We were not planning any outdoor activity and mostly were staying at home.... So, I planned my grocery-list accordingly. While our trip to Walmart, I attended a demonstration of Blue Bunny Premium Ice Creams. Ice cream had amazingly rich and creamy taste and it went great with fresh seasonal berries (used in demo). There were so many Blue bunny Ice Cream flavors and novelties to choose from! My favorite were Premium Vanilla, Homemade Vanilla, and Vanilla Bean! They had other flavors too like Butter Pecan or Strawberry but my heart was 'all set' for Vanilla flavors! I had some leftover Red Wine in my refrigerator, and some dark chocolate, plus this demo further fueled my creativity to go all-indulgent for long weekend's dessert extravaganza! 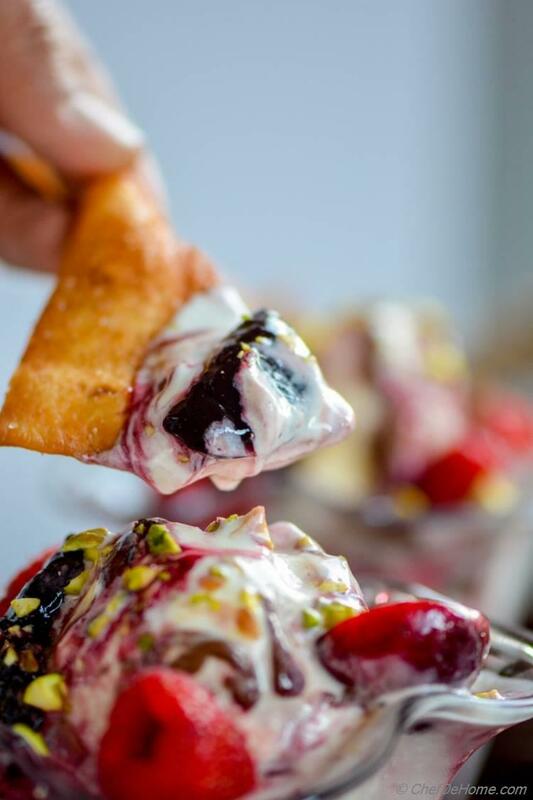 Scoop of creamy chilled Vanilla Ice Cream layered with fruity and floral Cherry-Red Wine reduction sauce, chocolate-cream sauce, fresh raspberries, fresh cherries, pistachios, crunchy cinnamon-sugar chips for scooping! Do you want to miss the scene? Or Do you want to miss deciding toppings?! 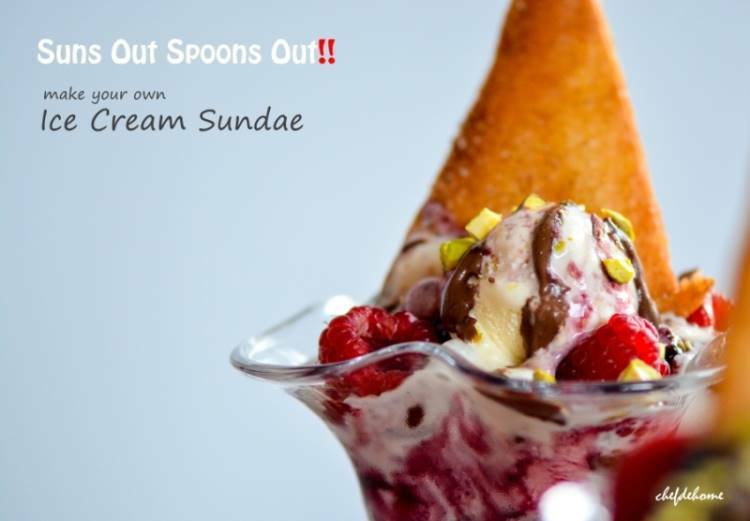 Try once, you will fall in love with these "make your own" Ice Cream Sundae! First, because it is served chilled, perfect to beat summer heat! Second, it is so full of vibrant colors and fresh berries that no one will resist asking for more. Side note: Berries are also rich in anti-oxidants! And last, but not least, you provide the ingredients and your family can have fun picking toppings of their choice! Like kids will have pure vanilla ice cream and lots of chocolate sauce with raspberries. 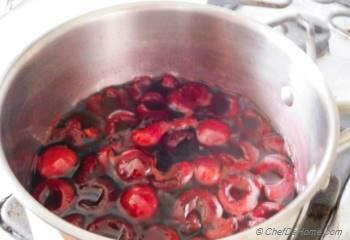 and grown-ups will like everything and not be able to resist cherry-wine sauce! I bet! Even if you planning to pack it for a Beach-Side Summer Party or Pool-Side Party, it is a fun-to-assemble dessert! Just make sure keep an ice box filled with ice to keep everything chilled and not-melting! I categorize this Summer Dessert as "Make Once Serve Anytime!" kinda dessert. Once you have Ice Cream Tub in freezer, all of the toppings can be prepared at-least few days in advance. Even though you can make chocolate cream sauce in advance. This one takes just 1 minute to whip. Really!!! No kidding. All you need is microwave safe bowl and a microwave(of-course). Cinnamon Sugar Tortillas chips will also stay good in an air-tight container for 2-3 days. Don't you skip these! Trust me, crunchy chips slathered in cinnamon and sugar makes every scoop of ice cream even more delicious! Only problem is, I always eat too much!! Oh! Gosh! I so wish I could make long spoon out of them! Let me ask you! What are your favorite Ice Cream Sundae topping? Hope you enjoyed your weekend and had great time! Smart Swap Use berries of your choice: Blueberries, and strawberries also go great! 1. 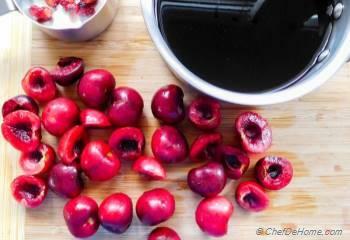 Cherry-Wine Reduction Sauce - In a deep, heavy bottom pan, add cherries, wine, starch, and sugar. 2. Bring to boil, reduce heat and set stove to medium heat. Simmer on medium-high heat until it thickens, reduces to half of it's original quantity. (about 20-25 minutes) Remove from heat and let it cool completely. Yields 1/2 Cup Sauce. 3. 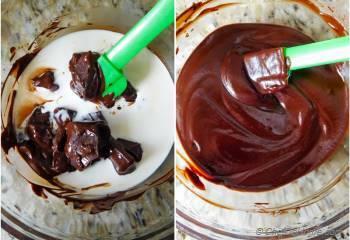 Chocolate Cream Sauce - Heat heavy cream in a small microwave safe bowl for 20 seconds. In a wide microwave safe bowl, add chopped chocolate and heated heavy cream. Stir to combine. Microwave again for 10 secs each time, stir after heating every-time, until chocolate melts fully. Set aside. Don't keep more than 10 secs each time or chocolate might burn/harden. 4. 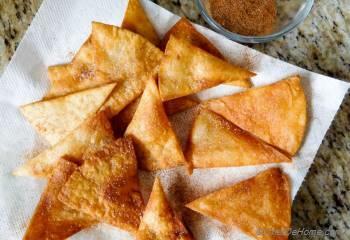 Cinnamon-Sugar Tortilla Chips: Heat oil for frying in a heavy bottom deep pan. 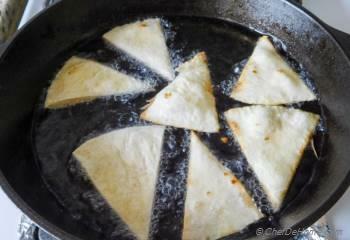 While oil is heating, cut tortillas into small wedges, about 8-10 wedges each tortilla. Also, combine sugar and cinnamon in a small bowl and set aside. 5. 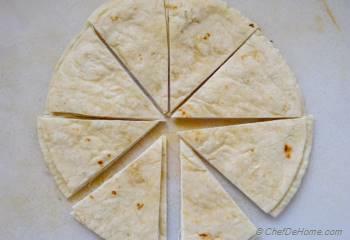 Fry tortillas until crisp and brown from both sides. Tortillas fry very quickly, just 1-2 minutes each batch. 6. Drain on a paper towel. Sprinkle liberally with cinnamon-sugar. Set aside to cool. 7. 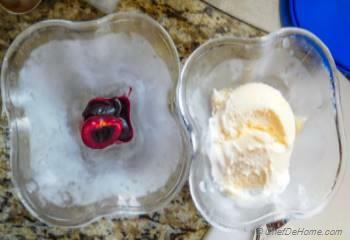 Assemble Sundae: Start with 1 tbsp cherry-wine sauce, top with few pitted cherries, then with scoop of Vanilla Ice Cream, then alternate with 1-2 or more (per choice) layers of Vanilla Ice cream with Cherry-Wine Reduction, Raspberry-Chocolate Cream Sauce, fresh cherries, and fresh raspberries. 8. Top with chopped pistachio nuts and cinnamon-sugar tortillas chips for some scrunchy scooping! Enjoy! If you like to multi-task, sauces and chips can be prepared parallel. 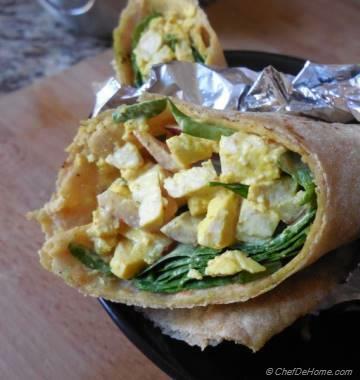 This will reduce cooking time to just 20 minutes. 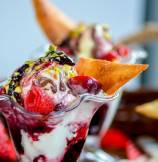 This ice cream sunday looks amazing!! Love those toppings :). That looks SO decadent and something that would make me very happy this summer. Oh yeah! Dannii, thanks my friend, summer is meant to enjoy ice cream!!!!! I love ice cream sundaes! They look perfect and so delicious, Savita! I am hooked, it looks so beautiful, just wow! Got to give this interesting recipe a try-period! 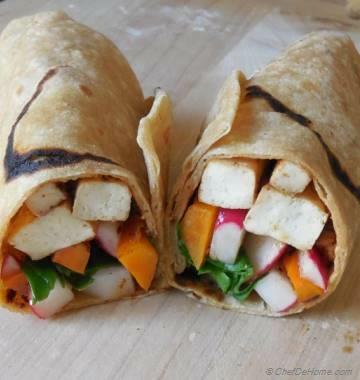 Shweta, you must try it! Wow! This is definitely a fun filled family treat! 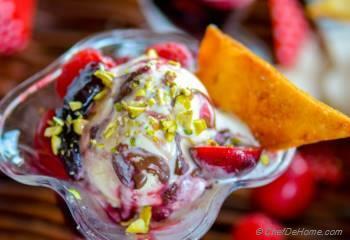 And that red wine reduction sauce sounds AMAZING for ice cream sundae! YUMMY! Anu, thanks! 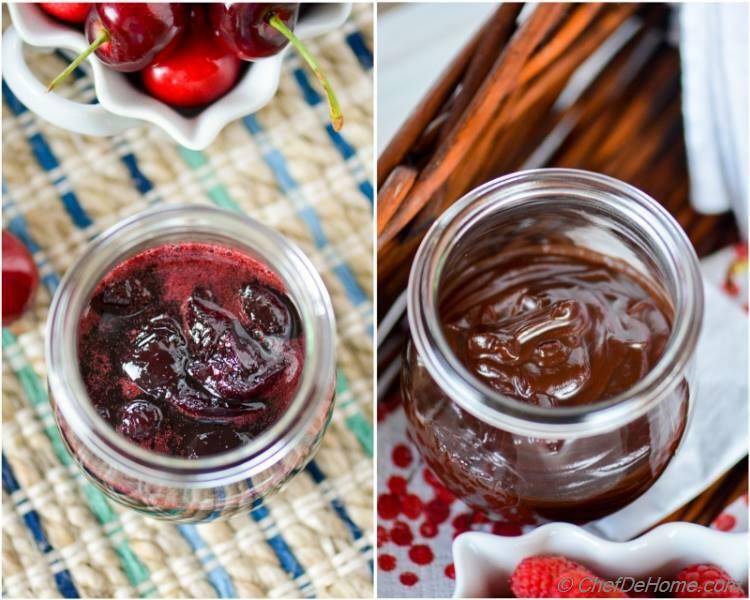 Red Wine reduction sauce is actually delicious on creamy desserts - ice cream,s even puddings too! This is definitely my kind of sundae! Great job! Love it! David, thanks! Our love for Blue Bunny Ice Cream is mutual! 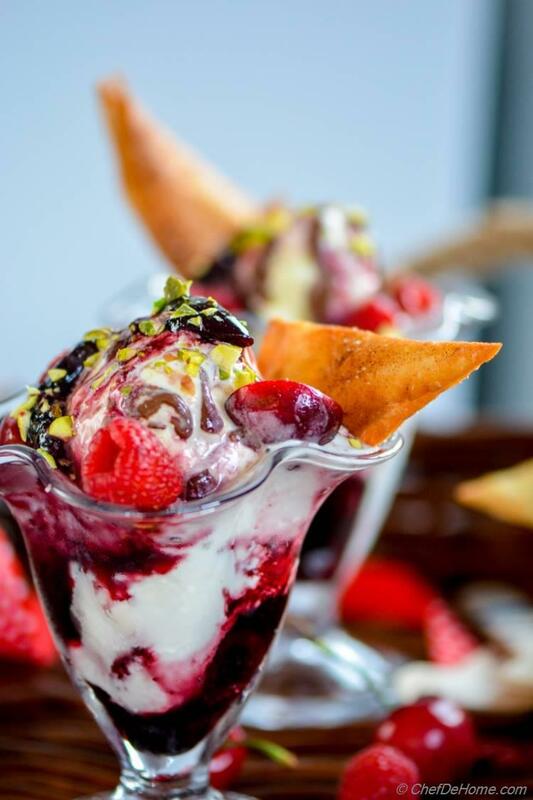 and you know what, red wine reduction sauce makes this sundae even more special! Glad you like it. Ice cream sundae AND cinnamon sugar tortilla chips? I think this is dessert heaven! I could eat this all day! Cathleen, thanks! Cinnamon coated chips were very delicious with sundae! a must try! lol!! Gauri, you are such a sweetheart! thanks my friend! I's glad you like it! Ice cream is my favorite treat! 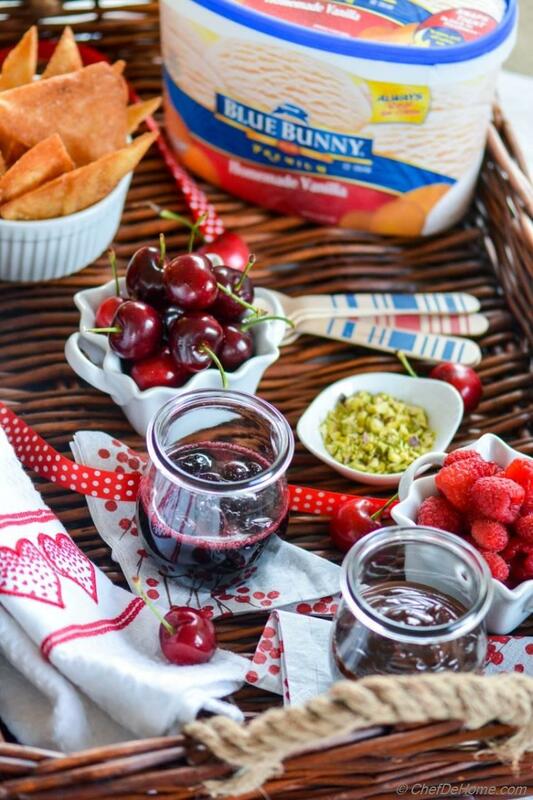 Love these fun sundaes! Kelly, thanks! I can never have enough frozen treats in summers! Just give me the tub of vanilla ice cream, and I am a happy girl - LOL! Ice cream sundae looks really delicious. Oh My!Its irresistible, Its gorgeous. Lovely presentation as always. :) thank you Kushi! it was indeed an irresistible ice cream sundae! This reminds me of childhood!! 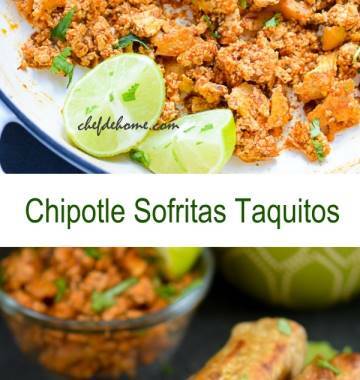 Looks so delicious Savita and those crispy tortillas just take it to the top! Ami, thanks dear! Bowl full of Ice Cream holds special place in my childhood memories too :) those were fun days! Isn't it?